A mocha cupcake with mocha ganache and mascarpone cream. And I decided that I must make that cupcake. 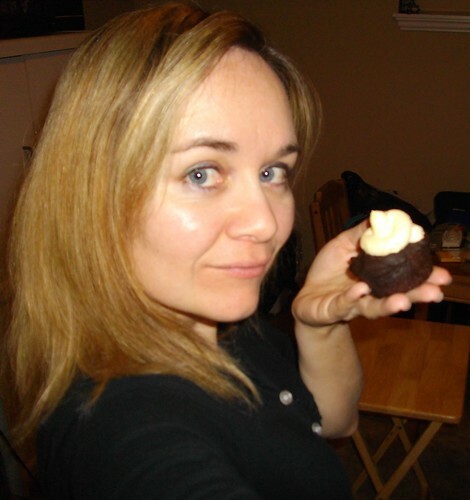 But it’s quite an involved cupcake, one that I needed a worthy occasion. Clearly, my birthday was just such an occasion. So, on Monday night I embarked on an epic journey of cupcake, ganache and mascarpone cream making. It took me most of the night – no doubt this was not helped by the fact that I was chatting online at the same time – and I had a near catastrophe when I put the first batch1 of cupcakes into the oven before the oven was preheated. Thankfully, the cupcakes baked just fine, despite their premature entry into the oven. For those interested, you can find the recipe for these cupcakes here. You should note that the recipe made about twice as much mascarpone cream than I needed for thirty cupcakes – which, if I’d thought about it, should have been obvious. I mean, two cups of mascarpone cheese plus two cups of whipping cream (that’s two cups *before* it’s even whipped!) was obviously going to make a hell of a lot of cream! In fact, I still have a container full of it in my fridge! So I’d recommend only making about half of what it calls for. And given that mascarpone cream is ungodly expensive, so only having to buy half as much = win! 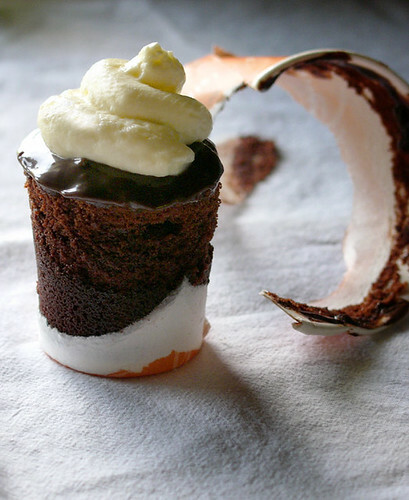 Image Credit: First picture of the cupcake was posted by chotda on Flickr. The other picture is by me!